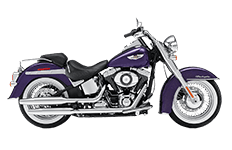 For many riders, the Harley Davidson Softail Deluxe motorcycle is the king of the road, and rightfully so. The king wouldn't be caught dead wearing cheap, imitation garments, so why would you outfit your royal bike with wimpy saddlebags. We proudly offer up this amazing collection of saddlebags designed specifically for the Softail Deluxe series, but don't be fooled by the affordable prices. Browse through each of the pages to learn more about each model, or give us a call and let us know about your needs.